This tutorial shows how to set crossover frequencies in an AVR/pre-processor for subwoofer and satellite speakers based on data captured by Dirac Live room correction. Bass management in AVRs provides crossovers that separate low and high frequencies. First the signal is split into two different channels. Then a high pass filter is applied to the channel that should carry only higher frequencies (signal going to a satellite speaker) and a low pass filter is applied to the channel that should carry only lower frequencies (signal going to the subwoofer). The crossover point is the frequency where the resulting two frequency response curves cross each other. High and low pass filters found in common AVRs aren't brick wall filters, i.e. both the subwoofer and the satellite speaker contribute to the response around the crossover frequency. The overlapping frequency region where there is significant interaction typically extends from about 1 octave below the crossover point (half the frequency) to about 1 octave above (double the frequency). Here's a graph showing how the low frequency portion (red) and the high frequency portion (blue) ideally combine (green). The crossover frequency in this example is 100Hz. Run Dirac Live, set target curves (make sure you're using the very same target curve for all speakers, including the subwoofer) and optimize. Examine the green "Average Spectrum (after) curve" for each satellite speaker (or group of satellites) and locate the frequency where the green curve starts to fall off from the orange target curve at low frequencies. This is the low frequency cutoff point (remove target curve break points below that frequency). The lowest usable crossover frequency is 1 octave above. Then find the high frequency cutoff point for the sub (remove target curve break points above that frequency). The highest usable crossover frequency is 1 octave below. The lower cutoff point for the left and right speaker is at around 40Hz. This allows a crossover frequency of 80Hz (40Hz * 2 = 80Hz) or higher. The lower cutoff point for the center speaker is also at around 40Hz. This allows a crossover frequency of 80Hz (40Hz * 2 = 80Hz) or higher. The narrow dip at 95Hz is probably not audible. The dip at around 60Hz is wider and potentially audible. In order to avoid it use 65Hz as the lower cutoff frequency. This allows a crossover frequency of 130Hz (65Hz * 2 = 130Hz) or higher. The lower cutoff point for the side surrounds is at around 90Hz. This allows a crossover frequency of 180Hz (90Hz * 2 = 180Hz) or higher. The upper cutoff point for the subwoofer is at around 260Hz. This allows a crossover frequency of 130Hz (260Hz / 2 = 130Hz) or lower. The hole around 90Hz indicates that Dirac Live couldn't boost enough to reach the target curve (max. boost is 10dB which is a lot) or that no boost is possible (response is non-minimum phase). In any case moving the sub to a different location might eliminate the hole. Generally speaking the crossover frequency should be as high as possible in order to benefit from spatially optimized, monophonic bass. On the other hand the sub(s) shouldn't become localizable which requires a crossover frequency of about 80Hz or lower. So ideally the target is a crossover point of 80Hz. In the example above a 80Hz crossover would work for all speakers except the side surrounds which would require a crossover at 180Hz. That's way too high. The subwoofer would most likely become localizable. Furthermore the subwoofer wouldn't support it anyway (max. crossover frequency is 130Hz). In such a case the first step is to change speaker and/or listening position. The early fall off could be caused by room effects. Rerun Dirac Live and check whether the response improved or not. If the speaker itself isn't capable of going deeper then it's time to get a better speaker. If any of this isn't possible then one needs to experiment with different crossover settings for that speaker. Often a hole in the frequency response of the surround channel caused by an inappropriately low crossover point is perceptually better than selecting a high crossover and the sub becoming localizable. On the other hand the surrounds have to work harder which can push them over their electrical or mechanical limit. Unfortunately AVR manufacturers haven't been very innovative when it comes to improving sound quality in areas where it would really matter, namely bass management. There is no automated solution for optimizing the crossover region between sub(s) and satellites (only exception is JBL Synthesis' ARCOS or Audyssey's now defunct installer kit). Some AVRs don't even have the ability to apply different crossover frequencies to different speakers, e.g. Arcam AVR390/550/850/860, Lexicon MC-10/RV-9/RV-6. Don't waste your money on such inferior bass management implementations which prevent getting the best out of your amps, speakers and room. A lot of AVRs come with bass management filters that don't sum to a flat response. For example 24dB/octave Butterworth filters create a peak of 3dB around the crossover frequency. Some AVRs present a mixture of 6dB, 12dB or 24dB filters which can produce disastrous results. 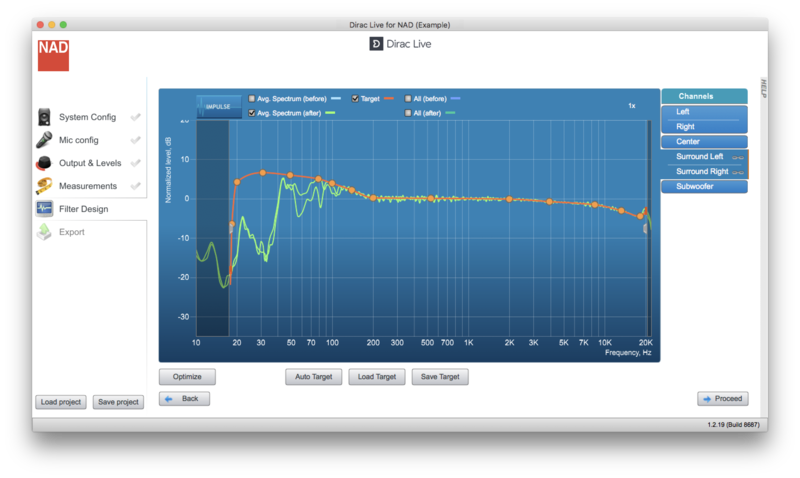 Bass management filters that work with Dirac Live need to sum to a flat response, e.g. 24dB/octave Linkwitz-Riley filters (see example at the top). Some (home theater) speakers are designed to fall off below about 80Hz. Such speakers won't work with Dirac Live because the usable speaker response needs to extend about 1 octave below the intended crossover frequency as explained above. Some subs have low pass filters that can't be switched off. Again such a sub won't work with Dirac Live because the usable frequency response needs to extend about 1 octave beyond the intended crossover frequency. If the sub's low pass filter is adjustable set it to the highest frequency available before running Dirac Live.